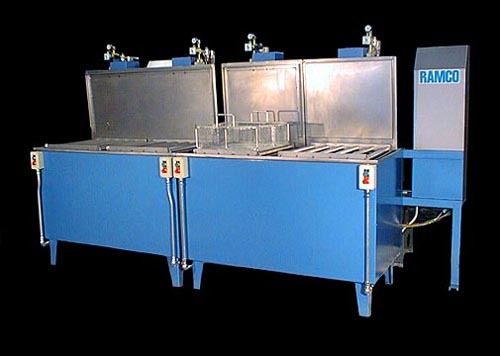 This Case History is of a typical Aqueous Degreasing System. The process objective was the complete removal of cutting oils from metal components. Each step incorporated a transport elevator to position and oscillate the parts within the different processing zones. The console runs left to right. The system consists of an immersion wash stage that can accept up to a 20″ long x 20″ wide basket with a gross weight of 150 pounds. A key expertise at RAMCO is the ability to incorporating the distinctive features of the process into a system that yields the optimum result. At the heart of each system is our patented NFPA Floating Cylinder used to transport and oscillate the process elevator. The process elevator is the basic building block for each step in the system. It is used to produce changing flow patterns when combined within other dynamic processing modes (in this case immersion/agitation washing, oscillating spray rinsing and hot-air-knife drying). The photo below shows the oscillating spray stage using side mounted headers. The parts are dried in a very effective hot air knife/blow-off dryer. All stages include digital cycle timers and temperature controllers. Platform roller conveyors are included on all stages to facilitate transfer. The system is built in accordance with Nema 12 electrical and NEC codes including the control panels, switches, pilot lights and lockout-tagout disconnect switch.